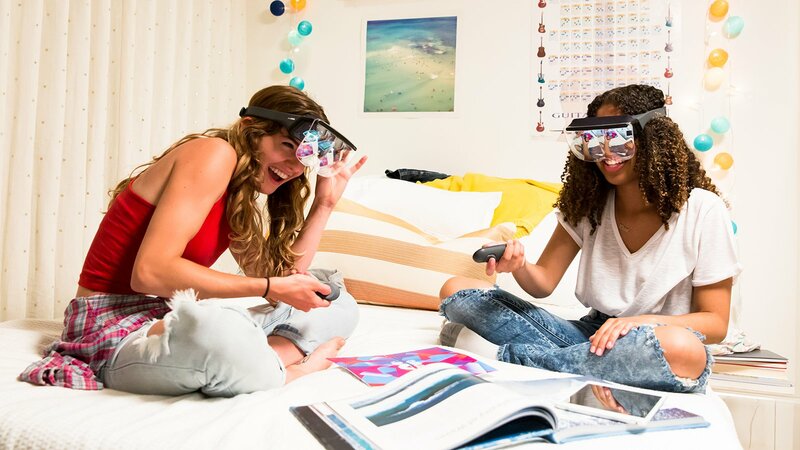 You have to see the Prism headset to believe it. While mobile VR is a vibrant market these days, thanks to the Gear VR and Google's Daydream View, the same can't be said for AR. If you want to dabble in augmented reality, you'd better be prepared to shell out at least $950 on hardware like the Meta 2, and even more for a beefy PC to run it. Microsoft's HoloLens, which helped to popularize the dream of AR, still costs a whopping $3,000. But Mira, a young LA-based startup, is hoping to make things simpler with Prism, its $99 mobile headset. Just drop in an iPhone 7, and you too can view AR atop the real world. Prism looks like a slimmed down version of the Meta 2, with a similar set of transparent, oversized lenses for displaying AR imagery. Similar to the Gear VR and Daydream, there's a slot for for your phone (it only works with the iPhone 7 for now). Instead of pointing the screen right at your eyes, though, you position it away from you. A set of mirrors reflects what's on the screen and repositions it on the front lenses. It might sound like a bit of a hack, but the result is a surprisingly clear set of holographic images in a relatively inexpensive device (not including the cost of the iPhone, of course). I had no trouble putting on the Prism; even though it looks a bit bulky, it's significantly lighter and easier to wear than either the Meta 2 (which needs to be tethered to a PC) or HoloLens. Mostly, that's due to the healthy layer of cushioning that rests on your forehead. The front lenses snap on magnetically, allowing you to easily remove them when you need to travel with the Prism. Mira has also developed a small motion-sensing controller, which is curved and fits into your hand like the Daydream View's. Most importantly, it also includes a trigger for your index finger like the Gear VR's remote. That's particularly useful for interacting with virtual objects. The remote also sports a touchpad on top, as well as menu and home buttons. Even though I only had a few minutes with the Prism, I was impressed with what I saw. I'm used to trying on headsets that are too expensive for most people to buy, so it was a bit of a shock that it worked at all. Beyond the initial setup experience, I played a holographic game that involved maneuvering a character through a maze, which relied on the controller's motion controls. Another game had me spinning around in my chair to destroy asteroids hovering all around me. I was surprised how well Prism tracked virtual objects in AR, even though it doesn't have any spatial mapping technology like HoloLens and Meta. Mira says developers will be able to build both single and multiplayer experiences with its SDK. Your friends will also be able to see your AR adventures on their iOS devices using Spectator Mode. They can also take photos and videos of you interacting with virtual objects, which makes the Prism experience a bit more communal than VR headsets. Of course, Prism will only be as useful as the software available for it. Mira says the initial release of the headset is targeted at developers, and it's partnering with a few studios to build more AR experiences. (You can expect to hear more about those in the coming weeks.) The company plans to ship Prism to developers this fall, and it should reach consumers by this holiday season. Clearly, Mira has a long and difficult road ahead, but Prism's low price and relative convenience could help it play an important role in the nascent world of AR.